Another very easy treat. Cut tops off of strawberries. Toss these and then cut the tip off but keep these. Pipe whipped cream and place cap back on top of this. Place two dots of whipped cream to make buttons. Then top the cap with whipped cream to make a puff on Santa’s hat. With the tip of a toothpick touch the whipped cream with a dot of black food coloring. Serve. 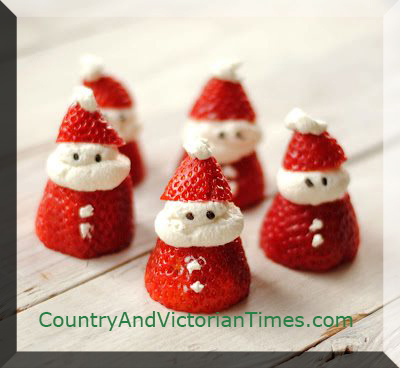 This entry was posted in Recipes, ~Dessert, ~Healthy, ~Party, ~Snack and tagged appetizer, coconut, cook, fruit, holiday, ice cream, santa, strawberry, treat, treats, Whipped cream, ~Christmas, ~Home, ~Party. Bookmark the permalink.